WOW! I can't remember the last time I enjoyed an animated film as much as Zootopia. I see an Oscar nomination for Best Animated Feature Film in its future. Going into the film I knew nothing about the story line; sometimes it is better that way. My only knowledge of the film was that it was about a society of personified animals (nothing unusual for animation there) and two unlikely friends. But, without giving too much of the plot away, I will say this film is much more than cute animals solving a crime. 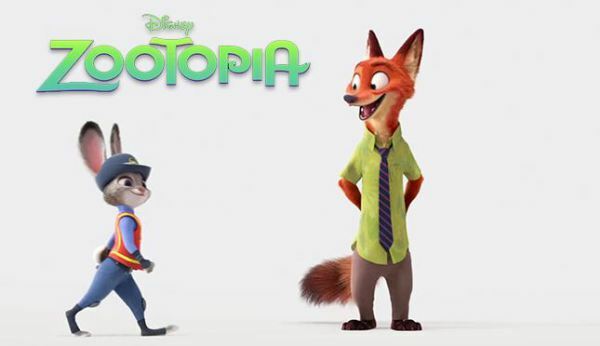 The film's two main characters, a bunny named Judy Hopps (Ginnifer Goodwin) and a fox named Nick Wilde (Jason Bateman), will speak to audiences on a very deep level. Judy and Nick are my new favorite Hollywood on-screen couple. That's right. I don't care if they are animated. Their chemistry, thanks to an awesome script, is undeniable. On the surface, and what most young viewers will take away from the film, is the theme of not letting anyone crush your dreams. Do not allow society to put limitations on what you can and can not do. Judy had dreams of being a police officer her entire life despite the fact that she was told numerous times bunnies can't be cops! I particularly loved the fact that the main protagonist was female and that her dream was to go into what is still today a male-dominated field. She is a great role model for young girls everywhere. Even after graduating from the police academy top of her class, she still had to fight to prove herself to the department. However, on a much deeper level, one that is sure to go over the heads of young viewers, is the very real life problem that has plagued humanity for as long as time - the theme of how stereotypes and prejudices lead to fears and how that fear is used to keep certain people down. In the city of Zootopia, the two opposing groups are predators and prey, and several characters have to face their own prejudgments of others if peace is to be regained. What they learn in the process is that some of these misconceptions are so deeply rooted they didn't even know they existed. In the end, we are reminded that change must begin inside each of us. Serious stuff, definitely. However, thanks to a very clever script, Zootopia also delivers many laughs for the entire family. One such scene takes place at the DMV which is run entirely by sloths. Children will delight in the comically slow antics of the sloths, while any adult who has ever lived through a trip to the DMV will find humor on an entirely different level. Overall, I loved everything about this film and strongly recommend it for families AND animation fans of any age. Zootopia is rated PG for some thematic elements, rude humor and action. However, there are a couple of scenes that might frighten very young children, therefore, I would save this film for those 5 and up at least. It was great. Hope you get to watch it. Thanks for stopping by my blog and commenting. I am glad you liked it too! My kids already want to see it over and over! I agree with your points though, so much underneath this fun story. Thanks as always for sharing your inspiration! I want to go again too!! !